Josh Frydenberg appears on ABC's Insiders. DEPUTY Liberal leader Josh Frydenberg has refused to address bullying complaints and kiboshed growing calls for gender quotas to get more women into parliament. Mr Frydenberg, whose predecessor Julie Bishop recently lamented the low number of elected Liberal women, pointed instead to his party's 50 per cent target for female representation by 2025. Appearing on ABC'S Insiders program on Sunday morning, Mr Frydenberg conceded the Liberal party had a woman problem. 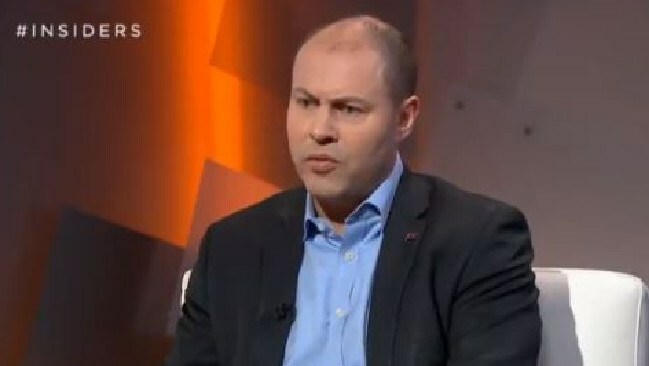 "Over the past couple of weeks the whole leadership change and spill took its toll on my colleagues, but these are not issues that are again confined to the Liberal party," Mr Frydenberg defended, before claiming there was a "toxic culture" in Canberra, citing the resignation of Labor's Emma Husar and the "notorious" Greens. "There's a broader issue here about parliamentary behaviour. Any of those discussions will remain internal. "I think what we do have is a problem in the Liberal party, which Scott Morrison is determined to address, which is to get more female representation in parliament. "In my first comments to the party room after having been elected deputy leader I said we needed to get more women into safe seats as well as at the top table. Scott Morrison in his first cabinet saw additional female representation." Mr Frydenberg pointed out two women were pre-selected on Saturday to run for Tasmanian Senate seats at the next election, with other women nominated for lower house electorates across the country. "We're focused on recruitment, retention, mentoring, which is absolutely critical here in order to get more women into these seats," he said. Less than a quarter of federal Liberal MPs are women, compared to almost 50 per cent of Labor politicians. "I think we're all focused on improving those numbers," Mr Frydenberg said. "Let's not forget the Liberal Party is a party of firsts when it comes to women. We had the first female in cabinet, the first female finance minister, foreign minister, defence minister. Obviously that is a very proud record that we want to continue." Liberal frontbencher Sussan Ley believes her party should consider adopting quotas to address the issue. "If you look at our party, the picture tells its own story," Ms Ley said late last week. Foreign Affairs Minister Marise Payne has also conceded the Liberals have a "very serious" problem with the number of women in parliament. The gender imbalance issue has bubbled alongside claims from Liberal MP Julia Banks and Senator Lucy Gichuhi that they were bullied and harassed by male colleagues during last month's bitter leadership coup. The bad behaviour led Ms Banks to announce she wouldn't contest the next election, while Senator Gichuhi has threatened to name and shame those responsible. Mr Frydenberg is confident Ms Banks will remain in parliament until the election. "She will not allow the people who have tried to bring her down a victory, and she will help ensure that the coalition wins the next election," he said. Opposition Leader Bill Shorten said the prime minister must be open and honest about bullying in the Liberal Party. "Bullies are not entitled to the protection of secrecy and they certainly should not be protected from the deliberate silence of an Australian prime minister," he told a Labor party meeting in Hobart. "If you want to know the difference in our priorities that our parties do about putting women in parliament, you only need to look at Tasmania. "We have a fantastic team of great Labor women, compared to the collection of has beens, and never weres, and Eric Abetz." Mr Frydenberg was repeatedly asked why Malcolm Turnbull was sacked, but refused to offer an answer. "The focus for the Morrison government and for all my colleagues is on delivering more jobs, lower taxes and essential services," he said.